Cars 3 will be zooming into theaters June 16th and we couldn’t be more excited. 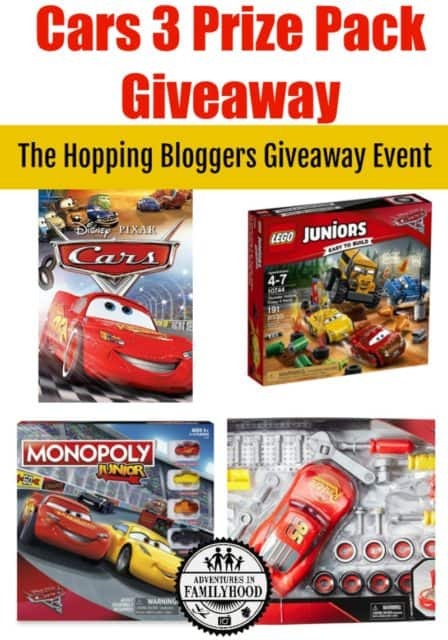 We’ve teamed up with The Hopping Bloggers to bring you an awesome giveaway perfect for the Cars fan in your life. As you probably know, we are big fans of the Cars franchise in our house. Our little guy has been obsessed with Lightning McQueen and Tow Mater (or Queen and Mater as he used to call them) since he was a baby. His 3rd birthday was a Cars Land themed party. We’re still hoping to get him out to Disneyland to see the real Cars Land someday. Also, Cars 3 is especially exciting for us since it will be the first time Jackson will get to see his heroes on the big screen. I know Jackson would be psyched to win any of these prizes let along all of them. Check out the details below to find out how you can win a Cars 3 prize pack. Enter to win this Cars 3 using the form below. GOOD LUCK!